There was drama on Monday at the National Collation Centre in Abuja as the Collation Officer for Ondo State, Prof. Kayode Soremekun, found it difficult to match figures of results that have been declared. For more than five consecutive times, Soremekun, a renowned International Relations scholar and Vice Chancellor of Federal University, Oye-Ekiti, Ekiti State, was grappling with the microphone and giving wrong figures. The situation brought the International Conference Centre to grumblings as people discussed the discrepancies in the figures in hushed tones. 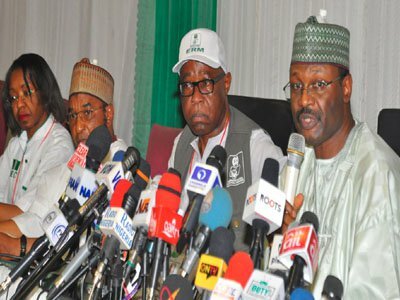 Consequently, the INEC chairman, Prof. Mahmood Yakubu, ordered Soremekun to tidy up the results and come back for representation, after the suggestion that the use of a ruler would not assist. Meanwhile, APC’s Muhammadu Buhari has maintained the lead in Kogi State where he polled 285,894 to defeat PDP’s Atiku Abubakar who got 218,207 votes. The Collation Officer and Vice Chancellor of University of Abuja, Prof. Michael Adikuwu, said there were 1,650,449 registered voters in the 21 LGAs in Kogi State. There were 570,773 accredited voters, 521,016 total valid votes, 32,480 rejected votes, while total votes cast stood at 553,496. But the agent of the Peoples Democratic Party, Osita Chidoka, faulted the results, citing irregularities in some Local Government Areas where there were killings and violence.